Alison Clarke shows how high the bear in her yard reached. Her bird feeder is more than 8 feet tall. Photo by Chris Julin. 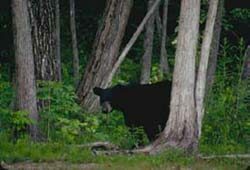 Bears, like this black bear peering from a north woods forest, have been moving into the city of Duluth. live where you’d expect – in the woods. But now, a few bears have decided to move to town. seen in the yard. Actually, she has more than birds on her list. 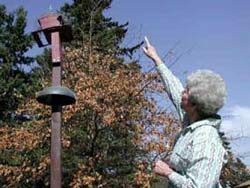 Out in her yard, she points to a bird feeder sitting on top of a wooden post. up permanent residence in town. corner of her house and came face-to-face with a mother bear and her cubs. his head in the trap to check out the bait, but he never stepped into the cage. killing them. The Department of Natural Resources says there’s nowhere to relocate the bears. left alone. And some of them aren’t sure. out in the backyard after dusk. And Kyra isn’t allowed to play in the yard alone. That probably isn’t going to happen. Martha Minchak is the state’s wildlife manager in Duluth. trappers to catch bears that are persistent trouble-makers – but that’s a last resort. like that will happen this year. City hall is getting some phone calls about bears, but the city has no plans to take any action. Duluth to lock up their garbage and pet food and quit tempting the bears. For the Great Lakes Radio Consortium, this is Chris Julin.